The wwPDB NMR validation reports are prepared according to the recommendations of the wwPDB NMR Validation Task Force (VTF; Montelione et al., 2013) and reuse common elements from the equivalent X-ray reports (Read et al., 2011; Gore et al., 2012); Gore et al., 2017). The NMR reports summarise the quality of the structure and highlight specific concerns by considering the atomic model and the chemical shift data. Analysis of the NMR restraints will be added in the future. The metrics shown in the "slider" graphic (see example below) compare several important global quality indicators for this structure with those of previously deposited PDB entries. The comparison is carried out by calculation of the percentile rank, i.e. the percentage of entries that are equal or poorer than this structure in terms of a quality indicator. The global percentile ranks (black vertical boxes) are calculated with respect to all structures available in the PDB archive up to 27 December 2017. The NMR-specific percentile ranks (white vertical boxes) are calculated with respect to NMR entries in the PDB. In general, one would of course like all sliders to lie to the far right in the blue areas (especially for recently determined structures, and in particular the NMR-specific sliders). For more information about validation metrics, see Montelione et al. (2013) and the review by Kleywegt (2000). There may be green, yellow, orange and red portions in the bar for each chain, indicating the fraction of residues that contain outliers for 0, 1, 2, ≥3 model-only validation criteria, respectively. A grey segment indicates residues present in the sample but not modelled in the final structure. Residues, which are not well-defined in the NMR ensemble are represented by a cyan segment (please see section 2 for details). The numeric value for each fraction is shown below the corresponding segment. Values <5% are indicated with a dot. The last table (see example above), when present, lists compounds that were perhaps not modelled adequately. The Chirality and Geometry columns show the number of models in the NMR ensemble where the listed compound is modelled with at least 40% of chiral centres or bonds, angles, torsions and rings as outliers. Individual issues and other details are listed in sections 6.4-6.7. This section is unique to NMR entries. Typically, NMR data is incomplete and often inconsistent, and thus the NMR structures include multiple models (collectively called an ensemble), which together fit the NMR data and may indicate variability within the structure. The NMR VTF (Montelione et al., 2013) recommends that the reports identify the well-defined residues in the protein structures as defined by the Cyrange software (Kirchner and Güntert, 2011). Nucleic acids are for now excluded from the analysis of well-defined regions. In some cases, these well-defined residues can be divided into distinct cores, which are internally rigid, but may exhibit some flexibility with respect to each other. The VTF also recommends that the NMR community adopts the medoid model, i.e., the model, which is most similar to all the other models (as measured by the backbone RMSD over the residues in each well-defined core), as the representative model of the NMR ensemble (see Montelione et al., 2013 and Tejero et al., 2013). The medoid model calculated on the basis of the largest core is chosen as the overall representative. The authors of the entry, however, can designate a different model as representative, based on other criteria. For the purpose of the wwPDB validation reports, the medoid representative is used if it was possible to identify it. Otherwise, the first model is chosen as the overall representative. The first subsection (4.1) reports residue scores averaged over the ensemble of models, while the second subsection (4.2) shows the scores for the representative model: medoid, if it was determined as described above, or author-specified one otherwise. Full reports show such plots for each member of the NMR ensemble. In each subsection, there are two graphics shown for each molecule. The first graphic is the same as that shown in section 1: the green, yellow, orange and red segments indicate the fraction of residues with 0, 1, 2 and 3 or more types of model-only quality criteria with outliers, respectively. Cyan section indicates the fraction of residues, which are classed as ill-defined, and grey represents residues which are present in the sample, but not modelled in the final structure. The second graphic shows the sequence annotated by these criteria with outliers in model quality (see example graphic below). The colour-coding described above is used here too. Residues, which are ill-defined by the NMR ensemble are shown in cyan with a green, yellow, orange or red underline to indicate their modelling quality according to the above scheme. Consecutive stretches of residues for which no outliers were detected at all are not shown individually, but indicated by a green connector. Residues absent from the final model are shown in grey. In general, the less red, orange, yellow and grey these plots contain, the better. It is important to realise that residues that are outliers on one or more model-validation criteria could be either errors in the model, or reflect genuine features of the structure. Careful analysis of the experimental data (chemical shifts, NOE peaks and restraints) is typically required to make the distinction. Outlier residues that are important for structure or function (e.g., enzymatic residues, interface residues, ligand-binding residues) should be inspected extra carefully (and addressed in a manuscript describing the structure). This section reports what structure refinement methods were used, how the final NMR ensemble was selected, and which software was used for structure determination and refinement. The overall statistics on chemical shift validation is summarised in the following table. For entries deposited after December 2010, the chemical shift files are taken from the PDB file distribution and are named as follows: <pdb_code>_cs.str. For older entries, the chemical shifts data are taken from the BMRB, if a mapping between the PDB and BMRB entries is available. In such cases, the BMRB ID is provided. For all other reports (e.g. those generated during deposition, annotation, etc), the user-supplied files are used. The table indicates if there were any issues when parsing (e.g., format compliance) or mapping (matching the structure) the chemical shifts data, and reports the overall completeness of assignment. These and other details are reported in Section 7. Quality statistics in this section are calculated using standard compilations of covalent geometry parameters (Engh & Huber, 2001; Parkinson et al., 1996), tools in MolProbity (Chen et al., 2010), Validation-pack (Feng et al.) and the wwPDB chemical component dictionary (CCD). For proteins, all of the below criteria apply only to well-defined ranges of residues as explained in section 2 (Ensemble composition). Nucleic acids, other non-protein polymers and ligands are included in full. This section describes the quality of the covalent geometry for protein, DNA and RNA molecules in terms of bond lengths, bond angles, chirality and planarity for all models and provides averages over the ensemble. There are two tables providing a per-molecule summary and four tables that provide information on (some of) the outliers for each criterion (if any; otherwise the table is omitted). 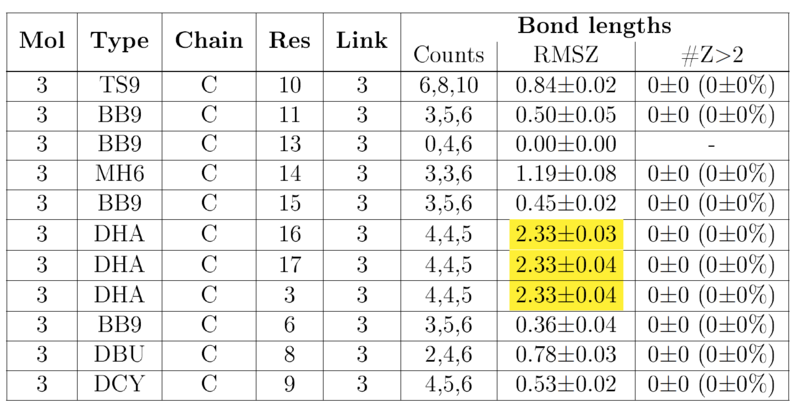 The root-mean-square value of the Z-scores (RMSZ) of bond lengths (or angles) is calculated for individual residues and then averaged for each chain and over the whole molecule. RMSZ scores are expected to lie between 0 and 1. An additional averaging of the averages is then performed over the NMR ensemble. For NMR structures, geometry is usually tightly restrained and small values are expected. Individual bond lengths or angles with a Z-score greater than 5 or less than -5 merit inspection. ‡ The figure after ± is the standard deviation of the value across the NMR ensemble. Total number of occurrences in the NMR ensemble for the given outlier. The worst Z-score of the bond length or angle for a given outlier over the NMR ensemble. The observed value of the bond length or angle. Observed: The observed value of the bond length or angle for the worst observed value over the ensemble. The model number in the NMR ensemble for which the outlier has the worst Z-score. All-atom contacts are calculated by the Reduce and Probe programs within MolProbity (Word et al., 1999; Chen et al., 2010). This method was developed to quantify the detailed non-covalent fit of atomic interactions within or between molecules (H-bonds, favorable van der Waals, and steric clashes). Since most such interactions involve H atoms on one or both sides, all hydrogens must be present or added (Reduce optimizes rotation of OH, SH, NH3, etc. within H-bond networks, but methyls stay staggered). At present, in order to ensure comparable scores between NMR and X-ray, hydrogen atoms are removed from the analysed NMR structure, and replaced by a different set placed by Reduce in idealised and optimized nuclear-H positions. All-atom unfavorable overlaps ≥0.4Å are then identified as clashes, using van der Waals radii tuned for the nuclear H positions suitable for NMR (rather than the electron-cloud H positions suitable for X-ray). Ill-defined regions of proteins are excluded from the analysis, thus if an atom from an ill-defined region is involved in a clash (even with an atom from a well-defined core), such a clash is not counted. MolProbity then calculates an all-atom clashscore, which is defined as the number of clashes per 1000 atoms (including hydrogens). Percentile scores of the clashscore are also computed, to allow assessment of how the structure compares to the rest of the archive. The number of clashes in which the atoms in this instance of the molecule are involved, followed by a clashscore for the given chain. Both numbers are averaged over the ensemble. The model in which a given clash has the worst magnitudes. The total number of models in which the given clash occurs. The number (and percentage) of residues in the favoured, allowed and outlier regions respectively, of the residue-specific phi-psi plots. These numbers are averaged over the NMR ensemble. Where Ramachandran outliers exist, up to five outlier residues are listed in a table in the Summary Report, whereas the Full Report will list all the outliers found. The table is sorted by frequency of occurrence in the NMR ensemble. How often in the NMR ensemble a given residue falls into disallowed/outlier region of the Ramachandran plot. Where outliers exist, up to five are listed in a table in the Summary Report, whereas the Full Report will list all the outliers found. The table is sorted by frequency of occurrence in the NMR ensemble. How often in the NMR ensemble a given residue is deemed non-rotameric. The percentage of nucleotide suites in the chain which Molprobitiy identified as an outlier. The value is averaged over the NMR ensemble. The percentage of sugar pucker outliers in the chain which Molprobitiy identified as an outlier. These are nucleotides where the strong correlation between sugar pucker and distance between the glycosidic bond vector and the following phosphate is violated. The value is averaged over the NMR ensemble. The overall suiteness parameter as defined by Molprobity. The value is averaged over the NMR ensemble. Where backbone or pucker outliers exist, up to five are listed in a table in the Summary Report, whereas the Full Report will list all the outliers found. The table is sorted by frequency of occurrence in the NMR ensemble. How often in the NMR ensemble a given nucleotide is deemed a backbone or pucker outlier. There are three summary tables providing a per-molecule overview and detailed tables that provide information on (some of) the outliers for each criterion (if any; otherwise the table is omitted). RMSZ: The root-mean-square value of the Z-scores (RMSZ) of all bond lengths (or angles). The values are averaged over the NMR ensemble. #|Z| >2: The number of bond lengths or bond angles that have a Z-score of less than -2 or greater than 2 compared to the total number of bonds / angles that have sufficient matches in the CSD is given in the #|Z| >2 column. In parentheses the number of outliers within the molecule is listed as a percentage. Both values are averaged over the NMR ensemble. Where outliers exist, up to five for each category are listed in a table in the Summary report, while the Full report lists all of them. Bond length and bond angle outliers are sorted by the Z-score of the worst instance in the NMR ensemble. Other outliers are sorted by the frequency of occurence in the NMR ensemble. How often in the NMR ensemble a given outlier occurs. The model in the NMR ensemble exhibiting the worst Z-score for a given outlier. Any chain breaks are identified in this section. It is unusual for NMR entries. This section is unique to NMR validation reports. It is split into subsections, one per distinct list of assigned chemical shifts. Typically, assigned chemical shifts are grouped into separate lists based on experimental conditions (e.g., different pH values). However sometimes, and especially prior to annotation, other criteria may be used by the depositors (such as assignments for distinct molecular components forming a complex are split into individual lists). Each subsection (7.X, where X is the list number) follows the same structure. Basic information about each chemical shifts list, such as the file name, title given to the list, and a table with the results of parsing the chemical shifts and mapping chemical shifts to atoms in the structure. The last row of the table gives the number of statistically unusual chemical shift values, as determined by the Validation pack (Feng et al.) software. The validation report will highlight any issues with nomenclature checks between the coordinate and chemical shift files. Any such issues with mapping or parsing (e.g., differing residue identities between chemical shift and structure data) are listed in subsequent separate tables. For publicly released entries, the chemical shifts data are taken from the PDB file distribution (file names of the following form: <pdb_code>_cs.str) or from the BMRB if the mapping between PDB and BMRB entries is available (BMRB ID is given in these cases). Should there be any issues with parsing the data or with mapping between chemical shifts and structure, separate tables listing the issues would appear below. In practice, mapping and parsing issues are only expected in preliminary reports. Depositors are encouraged to address such issues prior to deposition. In the example below, the chemical shift values need to be corrected as they are not numeric. PANAV software (Wang et al, 2010) is used to calculate the suggested referencing corrections for Cα, Cβ, C' and N nuclei. The standard error of the correction is estimated by jackknifing, i.e., running the software 10 times, each time omitting 10% of the data. In practice, suggested corrections can be ignored if they are too small (below 0.5 ppm) or too imprecise (below 2 standard errors). Significant difference between the calculated corrections for Cα and Cβ nuclei is also of concern. The following table reports completeness of chemical shifts assignment for different groups and different nuclei. Only assignable nuclei are taken into consideration (see Montelione et al., 2013, for details). For proteins, backbone is considered as C';, N, HN, and Hα*, while sidechains include Cβ, Hβ* and other aliphatic carbons, hydrogens and nitrogens in Asn, Gln, Lys and Arg side chains. The aromatic group includes all nuclei in aromatic rings. Completeness is calculated with respect to the entire well-defined structure. Thus for multimeric structures with multiple chemical shift lists, the completeness values may need to be added up to arrive at the final measure. Note that hydrogens are seldom assigned chemical shifts in solid-state NMR. 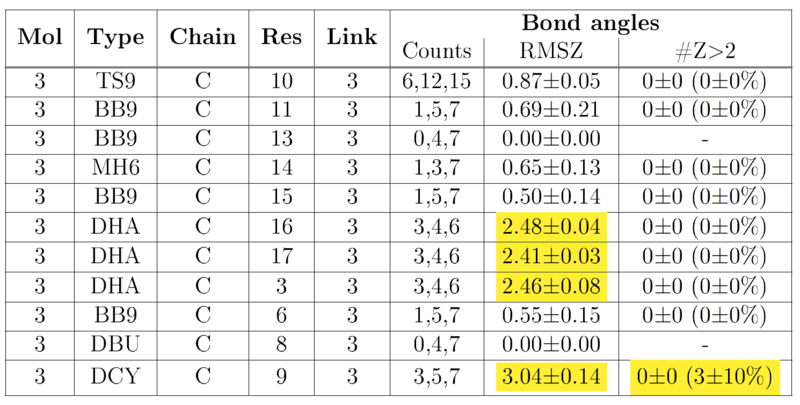 The complete report contains a second table reporting completeness of resonance assignments for the entire molecular assembly, i.e., including well- and ill-defined regions. Generally, statistically unusual chemical shift values can be classified into real outliers and artefactual ones. Real outliers can be caused by an unusual strained conformation, presence of strong additional magnetic fields (e.g., caused by aromatic rings) or because of paramagnetic phenomena. Such cases are of course not errors, and may in fact point to interesting features of the structure. Artefactual outliers, on the other hand are caused by interpretation errors (e.g., swapped assignments), processing errors (e.g., incorrect spectrum), failure to compensate for spectral aliasing/folding or referencing offsets. Such cases can often be easily corrected prior to deposition. The random coil index (RCI) is calculated for each protein residue by the RCI software (Berjanskii & Wishart, 2005) based on the measured chemical shifts and on the primary sequence of the protein chain. The higher the bar in the graph, the higher the probability that the given residue is disordered ("random coil-like"). The colour of each bar indicates whether the residue is classified as well-defined (black) or ill-defined (cyan) by the Cyrange software (Kirchner and Güntert, 2011), as described in Section 2 on ensemble composition. Therefore, ideally residues indicated by black bars should should show low RCI values (e.g., RCI value of 0.02 corresponds to an order parameter S2 of approximately 0.9. For further analysis of meaning of RCI, see Berjanskii & Wishart, 2005 and Berjanskii & Wishart, 2008.